Sevoflurane has an excellent safety record, but is under review for potential neurotoxicity, especially relevant to administration in infants and children, and rare reports similar to halothane hepatotoxicity. Sevoflurane is the preferred agent for mask induction due to its lesser irritation to mucous membranes. Sevoflurane was discovered by Ross Terrell and independently by Bernard M Regan. A detailed report of its development and properties appeared in 1975 in a paper authored by Richard Wallin, Bernard Regan, Martha Napoli and Ivan Stern. It was introduced into clinical practice initially in Japan in 1990 by Maruishi Pharmaceutical Co., Ltd. Osaka, Japan. The rights for sevoflurane worldwide were held by AbbVie. It is now available as a generic drug. 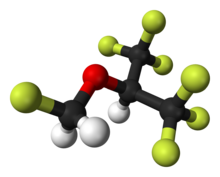 Sevoflurane is an inhaled anaesthetic that is often used to put children asleep for surgery. During the process of waking up from the medication, it has been known to cause agitation and delirium. It is not clear if this can be prevented. Studies examining a current significant health concern, anesthetic-induced neurotoxicity (including with sevoflurane, and especially with children and infants) are "fraught with confounders, and many are underpowered statistically", and so are argued to need "further data... to either support or refute the potential connection". Concern regarding the safety of anaesthesia is especially acute with regard to children and infants, where preclinical evidence from relevant animal models suggest that common clinically important agents, including sevoflurane, may be neurotoxic to the developing brain, and so cause neurobehavioural abnormalities in the long term; two large-scale clinical studies (PANDA and GAS) were ongoing as of 2010, in hope of supplying "significant [further] information" on neurodevelopmental effects of general anaesthesia in infants and young children, including where sevoflurane is used. The exact mechanism of the action of general anaesthetics has not been delineated. Sevoflurane acts as a positive allosteric modulator of the GABAA receptor in electrophysiology studies of neurons and recombinant receptors. However, it also acts as an NMDA receptor antagonist, potentiates glycine receptor currents, and inhibits nACh and 5-HT3 receptor currents. ^ Sakai EM; Connolly LA; Klauck JA (December 2005). "Inhalation anesthesiology and volatile liquid anesthetics: focus on isoflurane, desflurane, and sevoflurane". Pharmacotherapy. 25 (12): 1773–88. doi:10.1592/phco.2005.25.12.1773. PMID 16305297. ^ a b c Livertox: Clinical and Research Information on Drug-Induced Liver Injury (2014) "Drug Record: Sevoflurane", U.S. National Library of Medicine, 2 July 2014 update, see , accessed 15 August 2014. ^ Burns, William; Edmond I Eger II (August 2011). "Ross C. Terrell, PhD, an Anesthetic Pioneer". Anesth. Analg. 113 (2): 387–9. doi:10.1213/ane.0b013e3182222b8a. PMID 21642612. ^ a b c Costi, D; Cyna, AM; Ahmed, S; Stephens, K; Strickland, P; Ellwood, J; Larsson, JN; Chooi, C; Burgoyne, LL; Middleton, P (Sep 12, 2014). "Effects of sevoflurane versus other general anaesthesia on emergence agitation in children". The Cochrane Database of Systematic Reviews. 9 (9): CD007084. doi:10.1002/14651858.CD007084.pub2. PMID 25212274. ^ Vlisides, P; Xie, Z. (2012). "Neurotoxicity of general anesthetics: an update". Curr Pharm Des. 18 (38): 6232–40. doi:10.2174/138161212803832344. PMID 22762477. ^ Sun, L. (2010). "Early childhood general anaesthesia exposure and neurocognitive development". Br J Anaesth. 105 (Suppl 1): i61–8. doi:10.1093/bja/aeq302. PMC 3000523. PMID 21148656. ^ "How does anesthesia work?". Scientific American. 7 February 2005. Retrieved 30 June 2016. ^ A. Jenkins, N. P. Franks & W. R. Lieb (1999). "Effects of temperature and volatile anesthetics on GABA(A) receptors". Anesthesiology. 90 (2): 484–491. doi:10.1097/00000542-199902000-00024. PMID 9952156. ^ J. Wu, N. Harata & N. Akaike (1996). "Potentiation by sevoflurane of the gamma-aminobutyric acid-induced chloride current in acutely dissociated CA1 pyramidal neurones from rat hippocampus". British Journal of Pharmacology. 119 (5): 1013–1021. doi:10.1111/j.1476-5381.1996.tb15772.x. PMC 1915958. PMID 8922750. ^ a b Jürgen Schüttler; Helmut Schwilden (8 January 2008). Modern Anesthetics. Springer Science & Business Media. pp. 32–. ISBN 978-3-540-74806-9. ^ Brosnan, Robert J; Thiesen, Roberto (2012). "Increased NMDA receptor inhibition at an increased Sevoflurane MAC". BMC Anesthesiology. 12 (1): 9. doi:10.1186/1471-2253-12-9. ISSN 1471-2253. PMC 3439310. PMID 22672766. ^ Christa J. Van Dort (2008). Regulation of Arousal by Adenosine A(1) and A(2A) Receptors in the Prefrontal Cortex of C57BL/6J Mouse. ProQuest. pp. 120–. ISBN 978-0-549-99431-2. ^ Jürgen Schüttler; Helmut Schwilden (8 January 2008). Modern Anesthetics. Springer Science & Business Media. pp. 74–. ISBN 978-3-540-74806-9. ^ Suzuki T; Koyama H; Sugimoto M; Uchida I; Mashimo T (March 2002). "The diverse actions of volatile and gaseous anesthetics on human-cloned 5-hydroxytryptamine3 receptors expressed in Xenopus oocytes". Anesthesiology. 96 (3): 699–704. doi:10.1097/00000542-200203000-00028. PMID 11873047. ^ Hang LH; Shao DH; Wang H; Yang JP (2010). "Involvement of 5-hydroxytryptamine type 3 receptors in sevoflurane-induced hypnotic and analgesic effects in mice" (PDF). Pharmacol Rep. 62 (4): 621–6. CiteSeerX 10.1.1.587.5552. doi:10.1016/s1734-1140(10)70319-4. PMID 20885002. Patel SS; Goa KL (April 1996). "Sevoflurane. A review of its pharmacodynamic and pharmacokinetic properties and its clinical use in general anaesthesia". Drugs. 51 (4): 658–700. doi:10.2165/00003495-199651040-00009. PMID 8706599. Haria, M.; Bryson, H. M.; Goa, K. L.; Patel, S. S. (August 1996). "Erratum". Drugs. 52 (2): 253. doi:10.1007/bf03257493. This page was last edited on 8 February 2019, at 08:34 (UTC).